These cotton knit Hotline gloves provide a superior heat barrier up to 625°F! 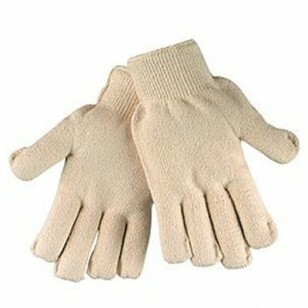 Gloves have a 2 ply "loop-in" seamless terry tacked on finger tips and thumb to stop slippage. Reversible seamless pattern doubles the life of glove and knit cotton allows for maximum comfort, breathability and flexibility. Ideal for air conditioning manufacturing, automotive industries, bakeries, ceramic plants, general appliance industries, heating manufacturing, metal stamping operations, operations requiring moderate heat and steam protection applications.